A big mini drop! Two surprise Crayboth were among the items on deck. Click here to see the March 31 2014 Onell Design drop menu. Argen returns, Commander Sullkren is back and improved greatly, plus other bits and pieces are to be had. Several hours after launch, nothing has yet sold out - this is good news for you if you want to get your orders in. 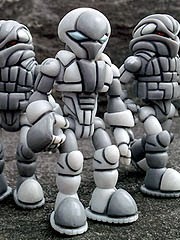 One of my all-time favorite Glyos figures is Commander Sullkren, and MK II is coming March 30! This version has more paint applications and a slightly higher price tag than the original, but still cheaper than eBay. Note painted toes, shoulder tampos, painted shoulders, plus some panel lines on the new guys - this will likely be a hot series. Click here for more pictures and details. Also up for grabs, a matching Dark Traveler, Argen MK XI (black), and a gold Noboto. Sullkren plays a role in the Mordles comics, so you may want to just snag one while you can. Also, Matt Doughty let slip that the next release will be Glyaxia - so clear some space on your shelf for blue and yellow in April! 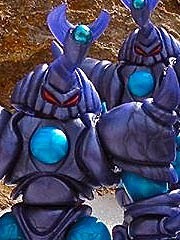 Despite what the name may conjure up in your head, the OMFG Mimic Armorvor isn't in that oh-so-fleshy color but rather a unique shade of blue that was used for the very first (and subsequent) Onell Design exclusive OMFG mini-figures. It's similar to early Pheyden plastic hues, and comes to you completely unpainted - accurately mimicking the deco of some OMFG figures, hence the name. Meet the new drop! Wings, figures, and more figures are up in TheGodBeast Shop right now! The wings are sold out, but you can snag each figure with its minifigure sidekick for $12.00 each. Grab them while you can! I've been itching to see a new painted style of Crayboth and Spy Monkey Creations surprised me by delivering a Crayboth Eaglet. Generally speaking the Onell Design figures are unpainted or have a couple of painted parts - shoulders, thigh, cannon - and a few panel lines. This one tosses that out entirely and gives the little guy painted "eyebrows," shoulders, a "beak," painted thighs, and yellow "talons" in "air quotes." Something old and new - Argen MK X is silver like the early Argen figures, but features a much lighter silver which Onell Design mastermind Matt Doughty has likened to Hasbro's recent Ultron from Marvel Legends. This one has a few extra bits and pieces - it was bundled with a set of Axis Joints, plus there's a new two-part head. One side has a swell robotic visor, while the other has a bit of an ominous, more alien design with a single large black eye. The head itself is what probably caused this figure to sell out in such a hurry, combined with the relative lack of Buildman-based characters like Argen as of late. More Kabuto Mushi Coming Starting Tuesday! Good news! 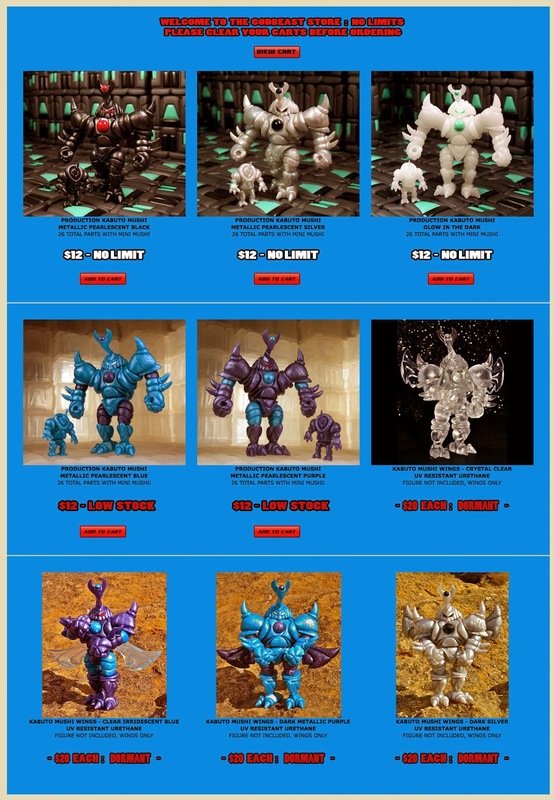 Marty "TheGodBeast" Hansen has announced 4 new colors of Kabuto Mushi on his site - and they're pretty solid choices, too. Kansas City Planet Comicon will have these starting March 14, while Chicago's own C2E2 will have them on April 25. They will be sold online Tuesday, April 29. Click here for the two blue colorways! Glow in the Dark and Ultra Silver figures will be on sale March 18 for $12 per - each one includes the mini figure as part of a set. Onell Design is nothing if not clever - numerous smaller runs of figures continue to sell fairly well, to the point where new, similar releases are required to fill demand for Johnny-come-latelies. The Gliporian Crayboth is similar to one of the first eight Crayboth figures from a few years ago, in that it was also clear orange. Matt Doughty's tireless search for the most eye-pleasing plastics continues to yield fantastic results.